Yes, I know. At times, my sense of humor is way too active and way too warped. You’re welcome. More than once, I’ve wished I could enact such a mock scenario with certain people. It might have helped them see themselves the way most of the rest of the world was seeing them. Grief is not a competition, but you wouldn’t know that by the way some folks treat it. That mindset prevails at both ends of the grief spectrum. Some people display the mindset that grief must be as intense and public as possible while lasting as long as possible. They make a direct correlation between the degree of grief shown and the depth of love felt for the deceased. To these people, a person who doesn’t grieve openly or deeply is either in denial or just didn’t love the person as much. In some cases that may in fact be true, but it’s a huge error to assume that it applies to all situations. The opposite end of the spectrum is where you’ll find those racing to get past their grief too fast. For them, to be too sad for too long is indicative of a disconnect with God. God is the God of peace and hope and joy, He wants us to have an abundant life. If we’re still mourning then there’s a problem in our faith walk. I have absolutely encountered some folks who needed a serious spiritual adjustment in the midst of their grieving, but it’s again a mistake to turn particulars into universals. We’re all different. We’re wired differently, we’re affected differently, we respond differently. Some people sprint through a period of grief, others limp along at a snail’s pace. I’ve seen mourners who deleted social media accounts and gave away possessions less than a week after the passing of a loved one. I’ve seen others who have preserved rooms of their homes as museums commemorating the ones who once occupied those rooms years ago. On both extremes, I can confidently assess that some of those folks have grieved well while others have grieved badly. Here’s the irony of that last sentence: I doesn’t matter what I think, because I’m not them! Neither are you! And you’re not me, I’m not you, etc. When it comes to grief, you have to be you. You have to know what you’re able to accept, and when. You have to know when it’s time to slow down and let things sink in, or when it’s time to push yourself out of your comfort zone to move forward. That’s not based on what anyone else has done, how they did it, or when they did it. In this case, it is all about you. It’s an unnecessary (and often heavy) burden to carry when you pressure yourself to grieve in the same way as someone else. You already have enough burdens to carry, why do you want to add one that you don’t need? You be you, you do you. Grieve well in your own way and time. Enjoy those daffodils along the way! It hasn’t been the most elegant crop of daffodils this year. More than usual, they seem to be blooming in “time release” mode. I walk around and see bunches of green, remnants of stems and leaves from the flowers that first appeared two weeks ago. In other places there are bunches erupting together. Then there are still the stems shooting up with blooms yet to emerge. The more I think about it, the more appropriate it seems for this year. And, the more I think about it the more I like it. For a flower enthusiast, it’s a glorious sight when the bulk of daffodils bloom around the same time. For a few days the yard’s plain canvas is decorated with yellow clusters, almost like the early stages of a Christmas tree in progress. This year isn’t one of those years, but that’s okay. The trade-off is that the daffodils seem to keep on coming, in my yard and in life. My dad’s been in the hospital for five days, a planned stay as he underwent a procedure on his heart. If things continue to go well, he’ll be discharged today. He’ll come home from the hospital on the same date that mom – for the last time – left home to go to the hospital. But, he’ll come home! Daffodils. Sometimes life lets us rest. Sometimes it pokes and prods us, forcing us to acknowledge circumstances we’d rather save for another day. It’d be nice if we could pick and choose when we’ll deal with the negatives lurking in the background. Then again, if we had that option then most of us would never actually “deal” with the really difficult stuff at all. In grief as in many other areas of life, there’s an element of choice. That choice is less about the specific moments when grief will hit us, or how we’ll grieve when it does hit us. Rather, it’s about our attitudes in general. We can choose to wallow in the mud of grief, determined to make it as deep as possible and to stay there as long as possible and to pull everyone we can into the mud with us. Or, we can choose not to do that. For those who choose the latter, it doesn’t mean that we don’t deal with moments (even hours or days) when our hearts are troubled by sadness. It means we accept that there are no exceptions, not even for us. It means we don’t view ourselves as the unfortunate victim in every negative circumstance as if God is conspiring to punish us more than the next person. It means we don’t allow the negative emotions to monopolize our hearts and minds, we’re also recalling the happy memories and actively looking for joy in our lives today. Eventually, it means that not everything is about the person who is no longer with us. For some of us, that last statement can seem harsh. There’s a subtle mindset – a lie – that we buy into, the believe that to no longer display sadness is to no longer feel love for the person who is gone. I’ve said more than once, “Don’t mistake my tears for being ‘not okay,’ and don’t confuse an absence of tears with me being unaffected.” I’ve walked the path with plenty of people whose mission was to keep someone’s memory alive. At times it became difficult to discern whether they were trying to keep a memory alive or fighting to keep a person alive. The latter is a painful, miserable, and futile place to be. Grief isn’t like a meal ordered at a restaurant, a loved one dies and then we digest all of our negative emotions in one sitting. It’s the stray dog that hangs around for prolonged periods, then he’ll disappear for a while before we come home one day to find him back on our steps. My encouragement to you: express your emotions when you feel them. When you feel sad, cry. When you feel mad, vent. When you feel confused, ask questions. One of the many problem areas of grief is that we try to keep too much bottled inside us. “I’m trying to be strong for _________.” Being strong and not showing grief have no correlation at all. I’ll even go so far as to suggest: 1) the strongest people are the ones who can allow themselves to display their most vulnerable emotions; and 2) those who try to portray a facade of strength are actually chaining themselves to sadness that will go deeper and last longer. When you need to grieve, grieve. Let it out. Take a moment. Step outside. Retreat to the bathroom. Gather yourself. Or, just lose it in front of everybody and make them awkwardly watch you for a few minutes! When you do need to grieve, though, make a choice. Determine your attitude about the grief you have. Will you bemoan the inability to see all of the daffodils in simultaneous bloom, or will you be thankful for the small, random flowers that keep popping up in your life’s yard? Daffodils are there. Go find them! “I don’t understand why God would take [insert the name/role of a person]. It’s just so unfair.” If we’ve never uttered a similar statement, we’ve all heard it expressed. We’ve probably heard it on multiple occasions. This post isn’t the time or the place to delve into the theological depths of “did God take them, or did he allow them to be taken?” There are plenty of other things we could consider as well, but someone more intelligent and more focused on that purpose can tackle those topics in their blog! What makes death unfair, from our standpoint? Is it that a person died “prematurely”? Is it the circumstances in which they died? Is it because he or she was such a good person? [SEE LAST POST] Is it nothing more than the adverse effect it has on us, emotionally or circumstantially? If you’ve ever said or even thought that the death of a particular person was not fair, then let me agree with you 100%. Death is completely totally wholly fully unfair. TO GOD! The gospel is the most beautiful story ever. Somebody died in it. The very singular person who did not deserve to die did just that, on behalf of everyone else who in fact did deserve to die. That’s you. And me. When we consider the essence of the gospel, who are we to presume to think that our situation is “unfair”? Life isn’t fair, we are unwise to expect fairness. BUT, we don’t really want what’s fair. We want preferential treatment for ourselves and our families. If God was fair then he’d have snuffed all of us out a long time ago, even the best of us. And we’d be in hell. Who’s raising their hand to sign up for that? Death isn’t fair, but we get the much better end of the deal (IF we acknowledge our sin condition and profess our faith in the one who died on our behalf). That’s a bed of daffodils right there! It can – and should – be a source of peace and hope when we realize God fully understand our pain because He knows how it feels. Sin can’t be in God’s presence. When Jesus became sin, a perfect and Holy God couldn’t look at that. On the cross Jesus asked the Father, “Why have you forsaken me?” That was literal and not a rhetorical question. God has felt the loss caused by death. God not only lost fellowship with humanity as a result of Adam’s & Eve’s disobedience in the garden, he experienced a separation from his own son when Jesus took our sin upon himself. Our God can relate to us, He understands our pain and He cares. More daffodils! This current series of posts has been an effort to build a theological foundation on which to grieve. We started by exploring that death isn’t natural, it goes against God’s original created order. We were reminded that there are no exceptions, death has knocked and will knock on the doors of everyone’s house. Death isn’t fair, but it’s unfair in a way completely opposite of how most of us normally think as we walk through our grief. No blog can change tangibly anyone’s circumstances. My prayer is that God might use these words to help even one person to gain a different perspective as they deal with those circumstances. If there are specific questions or topics you’d like to see addressed in this forum, if you’re aware of folks with stories that would be a perfect fit for a “searching for daffodils” entry, if any words here have been a blessing to you . . . PLEASE LET ME KNOW! You can leave a comment or e-mail me directly at searchingfordaffodils@gmail.com. It’s a blessing to me to be able to interact with folks as a result of this effort. Before retiring as an evangelism consultant with the Baptist State Convention of NC, one of Don McCutcheon’s many duties was to lead an intensive three-day “Intentionally Evangelistic Churches” seminar for pastors and other church leaders. In the very first session of the seminar Don would make a provocative statement: most churches exert significantly more effort praying to keep Christians out of heaven than praying for ‘lost’ people to find it. Don would then elaborate, reminding attendees of the typical church prayer meeting or prayer list. That point caused me to rethink the way I guided students to pray, but it also caused me to more closely examine the church’s attitude towards death & dying. Revisiting a number of scenarios over the years, my single-person assessment concluded that so many of us are stuck between being afraid of death and being arrogant towards death. I’ll try to explain. We’re all going to die. That’s revolutionary insight, huh? We all know we’re going to die. Sometimes we even say it out loud. But, when sickness and death visit our families they can catch us by surprise. We become panicky and desperate. It angers us. It’s easy to nod our heads and say “amen” when the preacher tells us, “God doesn’t promise us tomorrow.” When we’re forced to live that out firsthand, we want it to apply to everyone else and not ourselves. One of the biggest bluffs among Christians is to say “I’ll pray for you.” It’s unfortunate that prayer – for many – is reduced to a ritual during corporate congregational gatherings or before meals. I look back now at numerous occasions when prayer requests were being shared during a church gathering and someone would offer, “We need to have a SPECIAL prayer for ________.” What makes their request special? Usually because it involves somebody who is important to THEM who is very sick. I realize in hindsight that such a statement reveals at least two things about the person making it. In general, he or she doesn’t realize how special ALL prayer is (or should be). More specifically, the person probably isn’t offering much in the way of sincerely praying for anyone else’s concerns. When we personally encounter death in a way that people label “premature” or “tragic,” faith is really tested. When winters of grief are ushered in by these storms, it doesn’t mean God loves us less than the next family that seems to have everything always working out perfectly. It doesn’t mean that we’re being punished. It simply means God doesn’t make exceptions. For any of us. We’ve all heard some version of this statement: “I don’t understand why God would take such a good person when there are so many mean lying cheating stealing jerks in the world.” I get the deep, dark emotions from whence that thinking originates. I really do get it. Nonetheless, there’s an element of arrogance attached to a statement like that whether it’s intended or not. We’re ignoring the fundamental theological truth that none of us is “good” (I refer you to Romans 3:10 and Romans 3:23). We’re also asserting that someone else deserves to die more than our loved one, another family deserves to grieve more than we do. Let me be clear on a few things. I’m not suggesting that we shouldn’t pray for those who are sick or dying; we absolutely should. I’m not saying that we’re wrong to not understand God’s ways or His timing. I’m saying this: the less humble our attitude is towards death now, the more humbled we will be when it visits our house. Death reminds us of our mortality, it robs us of our connections, it can change our circumstances. Those are humbling – even troubling – realities. When we’ve already accepted that me and my family aren’t exceptions to the rule, we don’t have nearly as far to fall emotionally when it’s time to grieve. This post hasn’t been a waterfall of encouragement, has it? Stick with me, the end is better (and the next couple of posts will have a much more positive tone). Someone recovers fully from a horrific accident. Cancer is about to claim another life before a 180-degree turn occurs. A patient elects to undergo a surgery that he may not survive, and two weeks later he’s stronger than he’s been in months. These things happen and we’re quick to exclaim, “God is so good!” And He is. But He’s also the same good God when the accident victim doesn’t recover, when the cancer doesn’t go into remission, when the patient doesn’t survive surgery. That same good God loves us, unconditionally and always. Believe that, and there’s always at least one daffodil trying to bloom for you. DISCLAIMER #1: I hold to an evangelical Christian worldview. As such, my posts will reflect that worldview intentionally and unapologetically. My words are more likely to appeal to readers with a similar worldview, though I would hope the message will resonate with folks from a variety of perspectives. DISCLAIMER #2: The purpose of this blog isn’t to advise anyone how they should grieve; I’m not that smart. If I can help someone to grieve well, to make sense of their confusion, to overcome some emotional struggles, to see the daffodils on a cold & gray day . . . then I’ve succeeded. Today’s post is the first in a short series that I’m informally calling “A Theology of Grief.” My hope is that this series will help folks to have a strong, true foundation on which to build their grief. I’ve shared that perspective a number of times with my friends who are expectant parents, not to advocate a medical opinion but just because it’s funny. Recently, that line from a stand-up comedy routine has become to me a symbol of a theological truth: grief isn’t natural. Before you stop reading and your blood pressure escalates, allow me to clarify. Grief is “normal” in the sense that everyone deals with a wide-range of emotions in the wake of losing someone near to them. However, grief isn’t “natural” because death wasn’t part of God’s created order. In His original plan, life was meant to be forever and fellowship with God was meant to be unbroken. For those of us who have spent a fair amount of time in church, the first two chapters of Genesis are more than familiar. Then the third chapter of Genesis happens. When Adam and Eve disobeyed God, the consequences were many and significant. Humanity was messed up. The relationship between people and God was messed up. Creation itself was messed up. The greatest consequence of all was death, spiritually and physically. There aren’t any loopholes or exceptions to the consequences of sin, none of us are immune to the pain caused by death. The sooner we can accept this “no exceptions” reality, the sooner we will find peace in our grief (and in many other areas of our lives). It’s the truth that takes what isn’t natural and makes it normal. If we’re building a foundation on which to grieve, then this truth is the hard level ground underneath. In your lowest moments of mourning, has it ever occurred to you that all of your negative emotions are magnified simply because death is contrary to God’s created order? 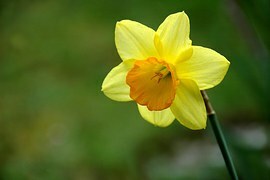 When you allow yourself to separate from those emotions, there’s an arrangement of daffodils waiting to be seen there. God never wanted us to die. More than that, God knows our pain. We lose people, He lost everybody all at once! When you look at it from an eternal and heavenly perspective, our grief pales in comparison to His. A postscript that may not apply to everyone but will to many: If the crux of your grief is simply that you loved someone so deeply and you miss them so terribly, then the yard of your life is already blooming with beds of daffodils. Sometimes we’re just leaning against the massive oak tree of sadness and it obstructs us from seeing the blessings that are there. It’s liberating when we get to a place where we can be more joyful over the time we had than sad or angry over the time that’s no more. If you’re striving to make it to that place, I’m praying God will provide the strength and perspective you need to step back from the tree. I’m praying for YOU to thrive in the midst of the daffodils that are already thriving around you. I’m between jobs, and “between” has lasted longer than I expected. It’s becoming more difficult not to be anxious about what might be next while I’m seeking the next season of life. As a vocational minister, one struggle among several is that I’m not currently making a significant contribution to the Kingdom. Wrestling through that struggle, I’ve been confronted by the reality that I’ve been running from one of God’s calls on my life for a while now. That’s the call to write. I recognized a long time ago that God gave me the gift of words. I’ve also known for a long time that I wanted to write, but never pursued it seriously for various reasons. “I’ll write someday,” I’d think. Over the past few days, a burden has settled in my mind and heart. I almost feel like God is telling me that – until I quit running from this call to write – the next season of life will be on pause. If God is indeed calling me to write, then what can I write to make a meaningful contribution to His kingdom? If there’s been an area of ministry in which I’ve felt especially competent, it’d be grief. I don’t have any more education in counseling than the typical pastor has obtained. I haven’t gained any more experience than the next minister. God has simply given me an ability to be calm and comfortable during those times when a life on earth is no more (or soon will be no more). And, He’s given me words for those times. Some of my most beautiful and meaningful experiences have been around a patient’s death bed or in walking with a family through the process of grieving. My circumstances over the past year have given me a new perspective. My mom died on March 19,2015, after a sudden and short battle with cancer. Her loss has presented any number of emotional challenges in the months since, yet I’ve been able to hold to the same truths that I’ve offered to other families in their grief. I’ve been genuinely surprised at what a comfort that dynamic has provided. My family now lives in the house that my mom called home from 1971 until she went to the hospital on March 6, 2015. Working in the yard was a passion for her. Every time I walk outside, reminders of her are always in sight. Mom had favorite flowers in every season, and daffodils were winter’s winner. She was a warm-weather lover, and daffodils are a harbinger that spring is on the way even if today’s air is bitterly cold. Daffodils are a visual respite for anyone who loathes winter. Much more than usual, I’ve been looking forward to the daffodils blooming this year. Yesterday they finally made their appearance. The winters of life aren’t governed by the calendar. At some point all of us go through grief like it’s a miserable season that won’t end. At some point we’re all searching for daffodils, figuratively if not literally. We walk through dark times needing the hope of a small bright burst from the cold ground to remind us, “This won’t last forever.” Daffodils are sticky notes on our hearts, lest we forget that the same God who takes away is the same God who gave what was taken in the first place. “Searching For Daffodils” isn’t the most masculine sounding title for a blog. Then again, I’ve never been confused with ‘macho’ (and the overwhelming majority of blog readers are female anyway)! Sooner or later, we’re all seeking joy to replace sadness. We’ll eventually need peace to prevail over discontentment, for hope to fill the emptiness. We’re all searching for daffodils. Is it possible that a blog can be an occasional vase of flowers on someone’s table of life? If I don’t start, then I’ll never find out. If I’ll write “someday” then someday is today.